Industrial IoT saves companies millions of dollars a year and provides impetus for infrastructure development. The smart watch may get the press, but smart connected sensors in the factory are quietly saving companies millions a year. Companies from Intel to Rio Tinto are reporting real bottom line results from industrial applications of the Internet of Things. That solid ROI is driving development of the infrastructure needed to ease further adoption in what will likely be the biggest market for the IoT. 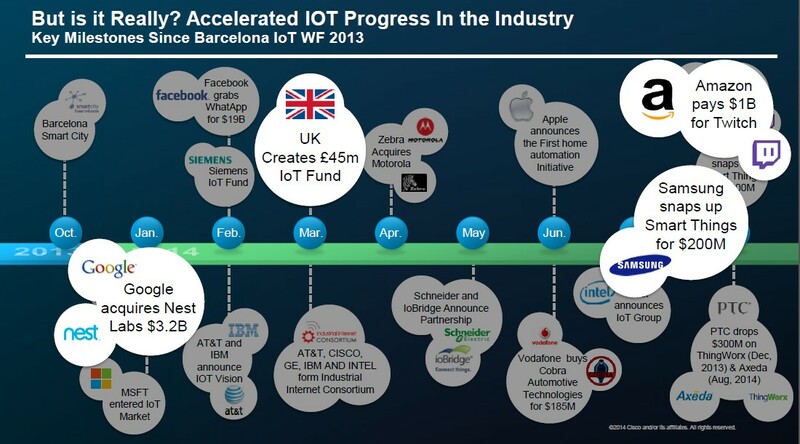 IoT Image 2Sensors and connections are seeing a jump in growth. Source: Cisco Systems compilation from multiple sources. With the IoT now reaching the peak on Gartner’s latest hype curve, speakers at the recent Cisco-sponsored Internet of Thing World Forum threw around a wide range of big numbers, for 50-100 million sensors eventually generating total economic opportunity of $3-$8 trillion and revolutionizing every sector. But for now the clear opportunity is in rather less revolutionary industrial applications of adding smart connected sensors and data analysis for things like preventive maintenance, energy savings, and remote asset management, diagnostics and repair. Intel reported saving $9 million in a pilot program at its assembly plant in Penang by working with Mitsubishi to add more sensors and more integrated analytics on its testers to allow preventive maintenance to increase yields and reduce maintenance costs. Doug Davis, Intel’s VP and GM of IoT, noted that even in highly automated and monitored chip plants, similar gains could likely come from other semiconductor equipment as well, by gathering more data on things like the motors, vibrations, and temperature a next level down from the data typically available, and then better integrating it with other outside data on how the systems interacted with each other. “We really believe we’re on the cusp of a revolution that will change businesses,” he summed up. “Last year it was the true believers. 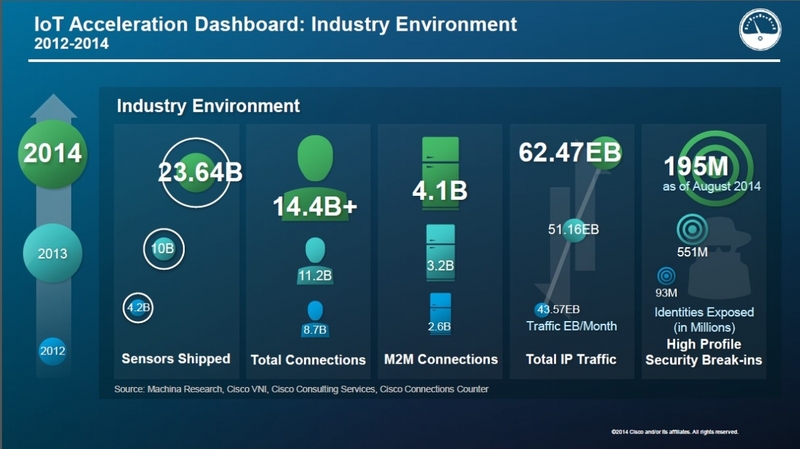 Now every customer—government and business leaders—get it,” said Cisco CEO John Chambers. “I think IoT’s impact will be 5x to 10x greater than the impact of the Internet so far.” Significant examples of economic impact are now being reported anecdotally from industrial applications, and most projections put sales to this sector soon to surpass the consumer side. Chambers cited a Cisco study that estimated roughly $4B of the $8B total IoT economic opportunity would be from the manufacturing sector. Plenty of other companies had similar case studies of savings from adding more smart connected sensors and more integrated data analysis, often on top of already existing automation and control systems. Real estate management firm Rudin said it saved $1 million a year in energy costs in one building by working with Cisco and Intel to add sensors, internet control, and data analysis to improve its HVAC control system, to allow more granular control of tenant equipment, from computers and printers to water coolers and window blinds, matched outside data like schedules and weather. Trucking company SAIA worked with Vnomics to added sensors to track and report a dashboard of integrated data on location, topography, driving habits and fuel usage to its trucks and saw a 6% reduction in fuel usage, for a savings of $15 million a year. The mining company MMG instrumented every asset to track when any fell below its expected peak performance, then immediately sent someone to fix the problem. Promptly fixing these every-changing bottlenecks allowed the company to extract 20% more capacity from the same assets, for a $1 billion increase in revenues, reported Pascal Brosset, CTO of Schneider Electric. A recent Cisco survey of some 1200 leading executives from varied industries around the world reported that 83% planned to invest in IoT over the next three years, noted Wim Elfrink, Cisco EVP, Industry Solutions and Chief Globalization Officer. Some of the more revolutionary applications of industrial IoT are in the mining and oil industries, with their expensive remote assets. 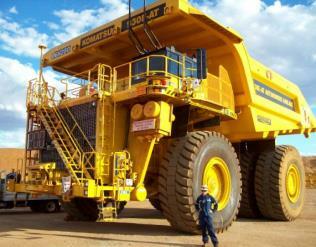 Current poster child of innovation in industrial IoT is, surprisingly, the mining company Rio Tinto. 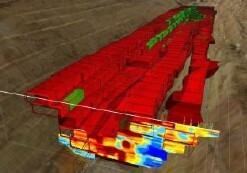 Its automated mining system, developed over the last seven years with the University of Sidney, uses hundreds of smart connected sensors to efficiently monitor and control and automate the removal and processing of massive quantities of ore from vast open pits with huge equipment in real time over the internet from remote control centers. “We just didn’t know this was called the Internet of things,” noted Head of Innovation John McGagh. Rio Tinto’s IoT system includes fully autonomous giant ore trucks that have been driving themselves around safely for nearly 4 million kilometers over the last several years. The location and condition of hundreds of other trucks and heavy equipment are also tracked with nearly 200 sensors on each of their engines, drive systems and tires, now sending some 4.9Tb of data a day up through the system to optimize management of these expensive assets. The constantly changing open-pit mine topography is also sensed and displayed in real time by lasers and cameras, while maps of the underlying geology are created as the automated machinery drills arrays of 12-meter-deep holes before blasting. The company also controls its huge ore concentrator plants through some 60,000 sensors and cameras monitored by remote experts. Procter and Gamble has found that integrating better smart sensor information from production into the IT system for business analysis has impacted the company’s R&D, its supply chain, and led to development of some new business models. “Once you have this information, it’s surprising how many places you can use it in the business,” commented Jeff Kent, Technical Associate Director, Product Supply – Engineering. The other major IoT users in the near future will likely be cities, who see both direct economic gain and better service to their citizens from smart analysis of more connected sensor data. IoT parking control systems can increase one of a city’s main sources of income, while installing LED streetlights reduces energy and maintenance costs significantly, and makes it easy to add connected sensors and wireless nodes at the same time for a range of other applications, from controlling signals for better traffic flow to enabling faster response to emergencies. Chicago uses internet networked sensors not only to show when the next bus will come, but also which roads have been plowed of snow, where a police officer needs help, and even where abatement for rats will be needed next. More than a dozen cities worldwide have announced plans in the last year to invest millions in smart city networks, often hoping it will help propel economic development. So far, though, parking control is the main installed IoT application, as it can make money for city as well as make life a little easier for its citizens. And it’s instructive as well for its business model—market leader Streetline, with ~40 city and university installations, sells its parking information not as hardware, but as a data management service. The hardware itself is fairly mature stuff: the sensors are magnetometer units that can be installed in a few minutes in each parking space, running on lithium ion batteries that last for 4-5 years, plus a Cisco camera system network, all connected in a mesh network from Dust Networks –for whom Streetline is now by far the largest customer. Customers pay the company an initial set-up fee per space, and then a modest monthly fee to manage the system and provide the data. The platform is open to app developers who supply a variety of apps for cities to control parking availability by dynamic pricing that matches price to current demand, for drivers to quickly locate open spaces, for enforcers to find and ticket cars who have overstayed their limit, and for parking garages to manage their business. Streetline eyes eventually adding other sensors and data management to its installed mesh networks. While the wide availability of low cost sensors, smart phones and broad band have enabled the first round of IoT applications, big future growth will require a much more developed ecosystem of optimized and interoperable components and systems. And an unprecedented degree of collaboration by the major players is now starting to try to make this happen. Any project typically requires integration of hardware and software ranging across sensors, to edge or fog (cloud close to the ground) computing, to networks, to data centers and data analysis. “Every customer situation requires suppliers working together,” said Chambers, noting how closely his company has been working with a host of other suppliers. AT&T, Cisco, GE, IBM, and Intel recently formed an Industrial Internet Consortium that now has some 60 other members forming working groups to specify common architecture requirements for particular use cases, address security issues in the architectures from the beginning, and fund and facilitate testbed experiments to develop new products and services that put together components and systems from different companies and technologies. 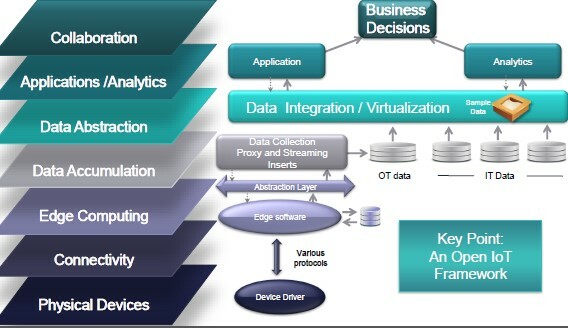 To assure the interoperability of the components in these layers from different suppliers, ~25 of the major players formed another group that spent the last year coming to consensus on a common reference model of how and where to transfer the noisy and changing real-time data from the physical devices, to the edge computing units to hold the data. This will require a new middle level of abstraction and middleware software to convert the data to appropriate formats compatible with use by current IT systems. Then there’s the problem of where all the people with the right skills to do all this stuff are going to come from. So another group of leading companies and educational institutions, including Rockwell, GE, Stanford and MIT have formed another consortium to create appropriate training and certification programs. “The availability of IoT talent will be the game changer for companies to succeed,” said Jeanne Dunne, VP&GM of Cisco Services, noting that the business world will need many times more data scientists and cyber security analysts than currently exist. Plenty of companies are also offering new hardware and software solutions all along the supply chain to help ease development and deployment of IoT applications. IBM introduced a commercial cloud platform, based on its in-house tools, for quickly getting data to the cloud and back, aimed to speed creation of IoT applications interfacing with existing industrial equipment for remote monitoring. IBM also said it aimed to form a partner program with certified recipes for connecting devices from partners, expected to include ARM, Intel and Texas Instruments among others. AGT, a seven-year-old Swiss company that’s quickly grown its IoT analytics business to $1 billion in annual revenues, will now also open its modular platform for analytics to speed development of applications. AGT has used this platform itself for applications as various as monitoring crowds to predict potential problems for huge European music festivals, to instrumenting China’s yellow river to predict flooding with 48 hours warning. One of the first outside users of this platform created a system for efficient control of river barge traffic in a European port. AGT CEO Mati Kochavi noted that IoT sensor data tends to be varied, noisy, irregular and vast, so it needs its own appropriate analytics, and suggested the AGT cloud-based platform offered a big library of analytic modules that could ease data management issues for application development. This year’s winner of Cisco’s innovation challenge, chosen from among 800 entrants, also targets easing development of IoT applications. German startup relayr offers an IoT developer kit that looks like a sectioned chocolate bar of Bluetooth-enabled sensor modules for motion, light, color, proximity, temperature, humidity, sound and infrared that can be attached in any the desired combination to a processor/RF module and easily programmed to quickly develop prototypes of smart connected devices. For more on the Internet of Things (IoT), attend SEMICON Japan 2014 (December 3-5). More information is available here.